Utilizing field peas as a protein supplement for grazing cattle is a viable option. Photo credit Karla Jenkins. 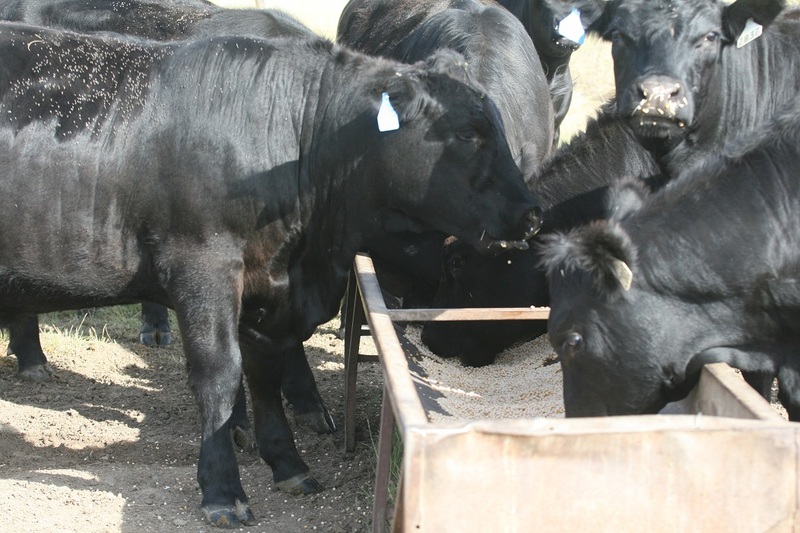 A very popular protein supplement for beef cattle in the Midwest is distillers grains, since much of this region is populated with ethanol plants. However, the western edge of the Midwest does not have the supply of distillers grains the central and eastern regions do. Additionally, many producers are limited to shipping in dried distillers grains due to either the availability of wet distillers, or the size of their operation limits the use of wet distillers before it spoils. Therefore, a two year study was conducted in western Nebraska evaluating the feeding value of field peas as a protein source for beef cattle relative to dried distillers grains so that an appropriate price for field peas as a cattle supplement could be determined. In this study, growing cattle grazing crested wheatgrass pasture from May to September were supplemented with 0.4% of Body Weight (BW) or 0.8% of BW of either field peas or dried distillers grains (DDGS). Cattle fed field peas at 0.4 or 0.8% of BW gained 2.13 and 2.15 lbs/day, respectively. Cattle fed DDGS gained 2.25 and 2.51 lbs/day for the 0.4 and 0.8% of BW levels, respectively. Field pea supplemented cattle had 10% lower ADG compared to DDGS supplemented cattle at 2.14 and 2.38 lbs/day respectively. So, if the field peas result in 10% lower gain, they need to be priced 10% less than DDGS. So for example, if DDGS is $150/ton at the plant, and costs $3.50/mile for trucking for 265 miles, it would cost $187/ton delivered. Therefore, the total cost of the local field peas would need to be $168.30/ton. If the local trucking cost is $7/ton then the cost of the field peas would need to be $161.30/ton or $4.84/bushel (60 lbs of field pea/bushel). Utilizing field peas (26% CP; 36% total starch) as a protein supplement for grazing cattle is a viable option particularly when other protein sources require extensive trucking. For more information on incorporating field peas into cattle rations, producers can contact Nebraska Extension personnel.